I was lucky enough to buy the porcelain prototype to the Little Miss Glamour doll that was intended to be released by Collectible Concepts Corp. 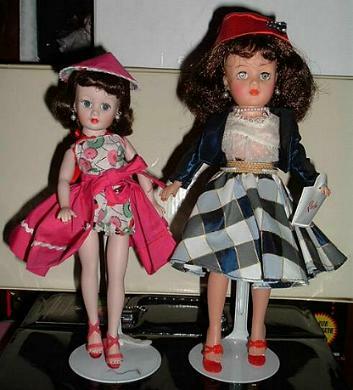 These dolls were never put into production. 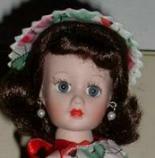 This doll is porcelain and resemble the vintage Little Miss Revlon doll. 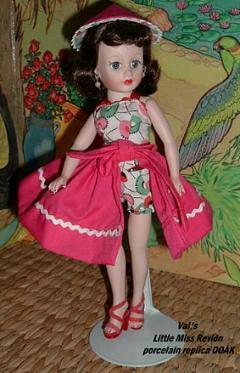 She is slightly smaller in size at about 9 1/2", but beautifully detailed and wears a vintage inspired outfit. 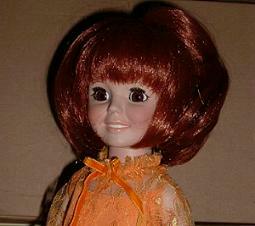 The doll is jointed at the neck, arms and legs, just like the vintage doll was. The porcelain grow-hair Crissy was released by the Danbury Mint in 2003 for $99. She is a wonderful replica and slightly smaller than the original Crissy. Her hair "grows" by pushing a button on her tummy and cranks back in with a crank on her back, just like the original. She wears a replica of the original Crissy orange mod outfit. She has sleep eyes and is jointed at the shoulders, neck and hips and comes in a replica box. Crissy with her hair cranked in to a shorter style. Crissy with her hair cranked all the way up to a very short style. Little Miss Glamour in her original outfit. 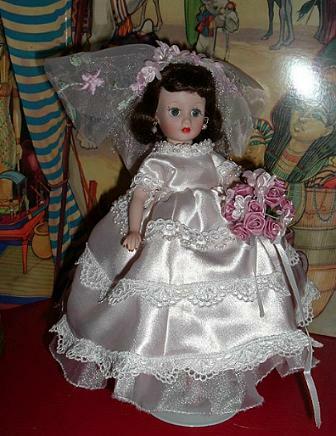 Little Miss Glamour in a custom made wedding gown from a Little Miss Revlon vintage pattern.